We found for you a discreet Asian eatery on Sheikh Zayed Road that is rate 4.5 on TripAdvisor. 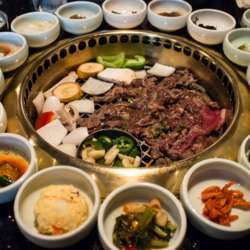 Sobahn means ‘good’ in Korean, and the restaurant certainly offers a good mix of Korean favorites. We will get the grill on, with all-you-can-eat BBQ meat for only Dhs145 including VAT. We will be seated at the outdoor terrace where we can enjoy the view of the Dubai skyline. Sobahn promises an authentic gourmet experience within a modern and trendy setting.